The man, the legend, Darren Latham. That name may sound familiar to you, and thats because he was the lead painter on the Games Workshop 'Eavy Metal team from 2001 - 2011 and a member of the sculpting team since then. It's no surprise then that his personal models are stellar. This is the first of two versions of this captain model that he has done, the second being a fantastic Iron Hands Captain. What is even more interesting is that the Captain mini is one of his own sculpts, and yet there is still conversion work done on it. All of the changes are pretty simple, swapping the head and power fist, a different right arm, and lastly Pedro Kantor's banner (with the design scraped off so he can paint some free hand of course). It's no surprise that the conversion work is seamless, making it appear that the model was like this way right out of the package. I really like the color choices on this mini, they are bright, but not distractingly so. 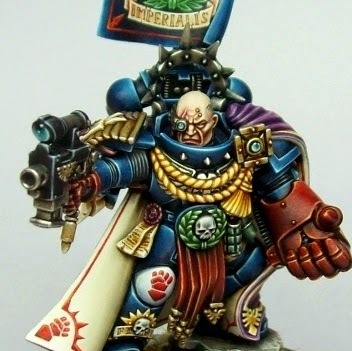 Of course the painting is flawless and a prime example of the 'Eavy Metal style. Again, no surprise, since the 'Eavy Metal style as we know it today was most likely designed by Darren. The purple cloak isn't something I would have thought of, but it makes sense when you consider how much red is already on the mini. All of his display bases are very simple, yet always have enough detail on them to catch your eye. They are used to frame the model and not distract from it. There's not much more I can really say about it, Darren Latham is the very definition of a painting (and sculpting) master. 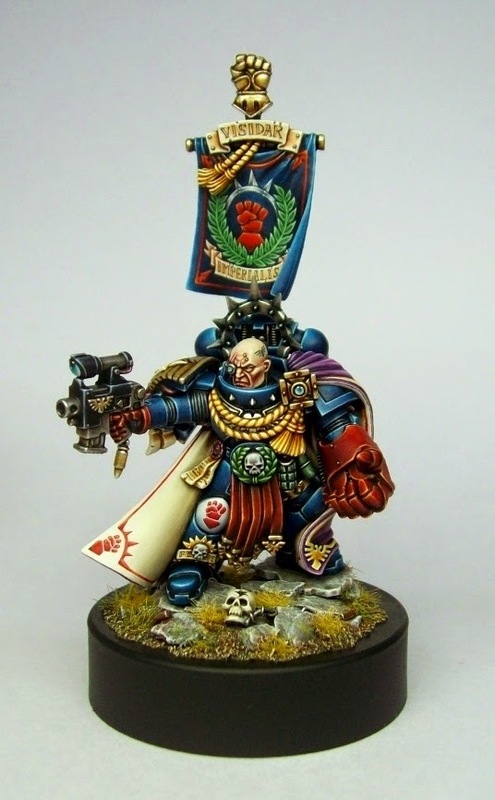 I know GW probably has rules against it, but Mr. Latham I would love to interview you for the Miniature Painting Masters series if you are able and willing. Heck, it's practically named after you.